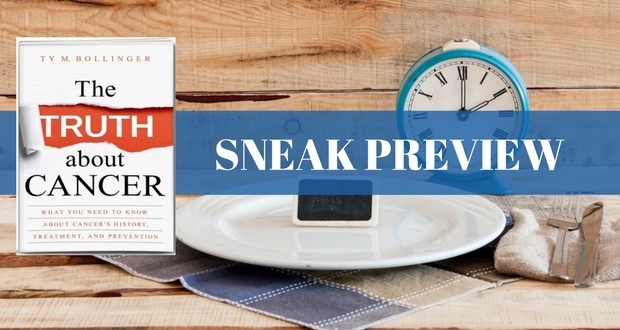 The following is an excerpt from The Truth About Cancer: What You Need to Know About Cancer’s History, Treatment, and Prevention (Hay House, 2016), by Ty Bollinger. 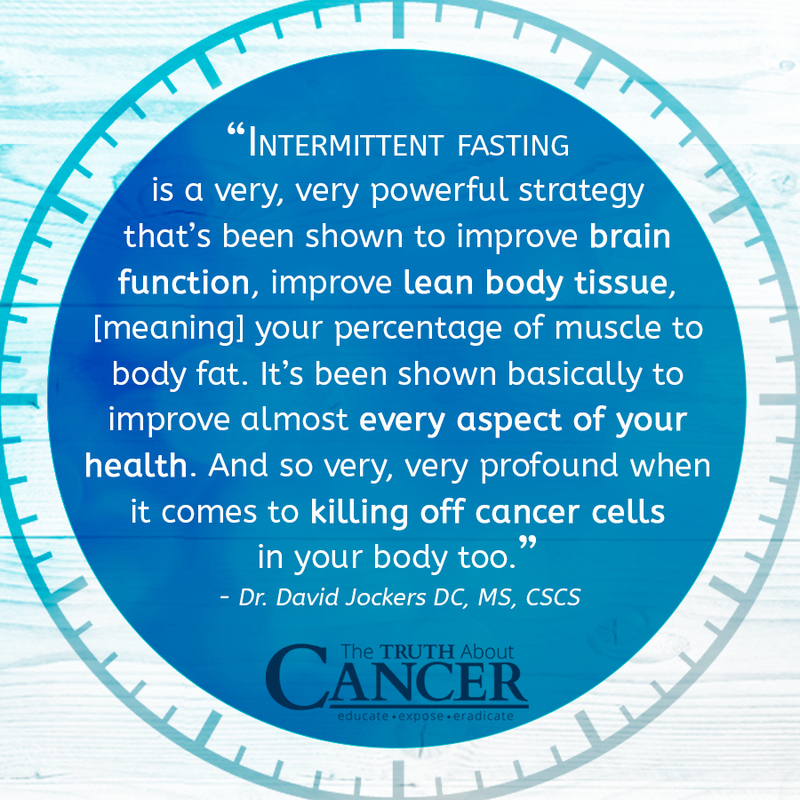 Many people do it for cultural and religious purposes, but fasting has a place in cancer treatment as well—and I’m not even talking about having to starve yourself for days at a time in order to see results. Simply adjusting the times at which you eat, a protocol known as intermittent fasting, can make all the difference in getting your metabolism back on track. It’s something they do down at the Hope4Cancer Clinic in Tijuana as an adjunct to the other treatments offered there. Dialing down the time frames in which patients eat from the typical morning, noon, and night routine, which can span upwards of 12 hours or even longer, to a much smaller 6- to 8-hour window during the middle of the day has helped many people conquer their cancers faster and with greater comfort throughout the process. Intermittent fasting has been shown to help boost insulin sensitivity and reduce insulin resistance, while at the same time promoting Enzyme and Metabolic /Mitochondrial Therapy normalized autophagy. Oscar Puig, a nutritionist at the Hope4Cancer Institute, is keen on the “Leangains” Method of intermittent fasting, which restricts eating times to between noon and 8 p.m. every day. This method is both effective and easy to follow because the daily schedule remains the same rather than changing. You wouldn’t think that depriving a person’s body of nutrition during certain hours of the day would have much effect on his cancer state, but it does. A 2009 study out of the University of Southern California found that cells respond to this period of being in “starvation mode” differently depending on whether they’re healthy or malignant. Healthy cells generally wait out this “lean period” by going into a type of hibernation mode, which protects them from damage. But cancer cells continue to grow because their genetic pathways are stuck in “on” mode, which makes them less resistant to stress and more prone to failure. The fact of the matter is that every type of cancer is treatable with metabolic therapy, whether it involves intermittent fasting, R-KD, enzyme therapy, or some combination of all of these. As Professor Seyfried puts it, all types of cancer have “the same, beautiful, metabolic target” painted on their backs, which means beating this dreadful disease is simply a matter of hitting it, and hitting it hard. I’m overseas and would buy it if it was available as an e-book. Wow so much great info. I am so glad to find Ty. Book has been ordered. Knowledge IS Power. Have learned so much from following TTAC. Looking forward to the book. Thanks. Very good. Really appreciated yesterday’s excerpt even more, but this information is also very valuable. As usual I have learnt so much even with this small excerpt and i am ready to make my tea. I can imagine the entire book. May God bless you and your family and the call you made to tackle this journey! You have made and will continue to make such a change in the life with or without cancer. p.s: Also, the catch phrase “The Truth about….” is spreading like wild fire that I saw it on small leaflets in my son’s school…to name the few ” The truth about Drugs”, “Truth about Marijuana” etc. Hello, thank you so much for great information. God bless you all. I really enjoy reading all the articles. Wish for the best. Ty, I don’t have cancer (to my knowledge), but I found the TTAC invaluable. You did a great great job. I learned lots of useful information and I’m applying some of the guidelines to my lifestyle. Is it possible to buy an electronic format of the book? I live in Italy and prefer to download it, as a PDF or else, in my device. A soft cover book and cheaper postage please. The hardcover and postage is far too great when you are struggling financially. Don’t want electronic books as sitting at a computer is cancer causing and we should all limit our time on mobile phones and computer. Many thanks for the information you have given but I do not wish to continue to receive the daily emails or with the monthly payments. Great idea to not eat all day everyday, I feel relieved of bloating if I eat smaller amounts of food some days and I don’t get as tired during the day if I wait to eat in the morning. Olivia I thought people with cancer should stay away from fruit?